Trustus Theatre’s Season 34, The Art of Adaptation, continues this spring with their production of F. Scott Fitzgerald’s The Great Gatsby. This American classic novel, adapted for the stage by Simon Levy, will take audiences back to the Jazz Age and will incorporate local talent from Trustus Theatre actors, Columbia City Ballet dancers, and Cola Jazz musicians. It will be directed by Trustus Theatre Artistic Director Chad Henderson with an original score by Mark Rapp and choreography by Stephanie Wilkins. 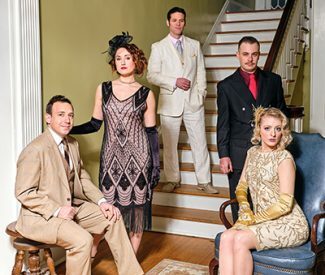 F. Scott Fitzgerald’s The Great Gatsby will open on Trustus Theatre’s Main Stage on Friday, April 5, 2019 and will run through Saturday, April 27, 2019. Tickets may be purchased at www.trustus.org or by calling the Trustus Theatre Box Office at 803-254-9732. Opening night is Friday, April 5, at 8pm. Wednesday, April 24, Thursday, April 25, Friday, April 26 and Saturday, April 27 all at 8pm.